It’s clear that the Liftstyle Lift ® (LSL) brand is a marketing juggernaut. Cable, non-cable, internet, Debbie Boone is everywhere “lighting up my life.” Their TV testimonials are uplifting by simply showing regular people with that blank stare pre-operatively and that smiling, happy visage after their LSL. It is easy to see why there are so many lawsuits accusing this marketing company of being false and deceptive in their TV ads. One of the oldest plastic surgery tricks to improve facial surgery results is to take the post-op photos of the patient smiling; smiling is the first and best natural rejuvenator lifting the sagging face without a single stitch. Giving in to the “marketing police,” the LSL folks do add a few sentences in fine print at the bottom of the TV ad admitting that each patient had a litany of other procedures in addition to their LSL. It is the other procedures in the small print that actually determine the quality of the result and are the subject of this article. Over the time that I’ve been in practice, two things have actually vastly improved my facelifting results. Recently, it has been the use of local anesthesia with sedation rather than general anesthesia. The second improvement has been improvements in the neck contouring and the blending of the lower eyelid with the cheek as an adjunct to our version of the mid-face lift. In the LSL marketing parlance these are called “neck firming” and “eyelid firming” procedures that really make a difference in the quality of the result, especially when the patient is not smiling. 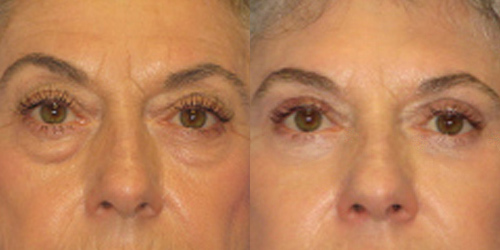 Eyelid blending has always been a problem except in the extreme cases of facelift procedures done at deeper levels that allow for more tension on the SMAS and facial muscles with their fascia. These operations are not an option for many people who cannot take 3-6 weeks out of their busy schedules to be swollen. One of the integral causes of the dark circles and lower lid “crescent,” in addition to the weakening of the tissues that are meant to contain the lower lid fat allowing the fat pockets to bulge outward, is the dropping of the thin lower eyelid skin down onto the cheek accentuating the junction between the thin lid skin and the thicker cheek skin. Lifting the midface necessarily raises the lid-cheek junction upward creating excess lid skin. This is addressed surgically by making a lower lid incision through the muscle so that the lid-cheek junction at the orbital bone can be addressed directly. Blending of the lid and cheek is done at the same time that the bulging fat is partially removed or simply cauterized. The remaining tissue (septum) is cauterized to thicken it so that it can then be bolstered by dissolvable sutures. The extra lid skin created is conservatively excised and a temporary muscle tightening stitch is placed to keep the lower lid from pulling down during the early phase of wound healing. The basis of a good result in the lower eyelids as well as the neck is the performance of a proper mid-face lift with an aggressive approach to the jawline and jowls. The LSL, when done well, can provide this platform to address the neck, lower eyelids as well as the cheek as a unit. It is very rare to see a patient who has never had surgery that requires only a mid-face lift making these so called “firming” procedures an integral part of facial rejuvenation yet they only get a small print footnote in the marketing juggernaut that is the Lifestyle Lift®.